Description: Cambrooke’s dry batter mix now comes in a new 2 lb convenient plastic pouch. 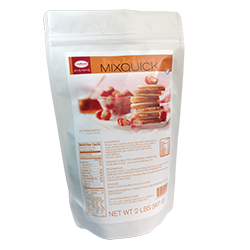 Scoop out what you need to make fluffy pancakes, waffles, biscuits, crepes and anything the popular B’Quick can make. You won’t believe how easy it is! Serving Suggestions: Try the Quick and Easy Pancakes, Biscuits and Waffles recipes on our website. Ingredients: Wheat starch, canola oil, fully hydrogenated cottonseed oil, sugar, polydextrose, baking soda, sodium acid pyrophosphate, monocalcium phosphate, methylcellulose, xanthan gum, natural flavor. Contains wheat. May contain soy.